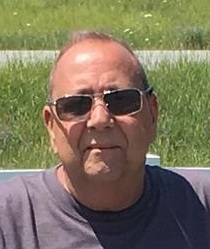 Steven (Superman) Michael Shields, passed away in his home on April 11, 2019 at the age of 63 surrounded by his loving wife and their children after a long courageous battle of bladder cancer. Steve leaves behind his wife, his high school sweetheart, Patricia (Duncan) Shields. Two daughters, AmyLou Shields and her companion Frank Termini, Hollie Shields and her companion Steven Martel, two sons, Dow Shields and Dalton Shields. He was the world's greatest Papa to his most precious treasures, Kaleigh Ann Carpino, Jessie Steven Martel and Lucia Marie Martel. Steven was a driven professional with a extraordinary love for his family, his Harley Davidson, and music. When diagnosed with bladder cancer in 2011 he remained dedicated to his work and in his will to fight his illness. He remained a brave Iron Willed man even throughout his final months. He worked at Hoffman Auto and Schaller for many years before his illness took it's toll. He was a member of Odd fellows and Masonic Lodge. Life is not about the destination it's about the journey. Besides his wife and children Steve is survived by his parents, Carl and Elfrieda (TeeDee) Shields, his siblings Brenda Senesac, Carl Shields and Hilton Shields. He is predeceased by his brother, Clarence Shields who died in infancy. Several nieces and nephews several close friends and his best friend Craig Tracy. Relatives and friends may call at Dunn Funeral Home 191 West St., Bristol on Tuesday from 10:00 to 1:00 PM. A ride along will follow to Pequabuck Golf Club for A celebration of life. The family with also like to especially thank the staff at Memorial Sloan Kettering for their constant attentive treatment.